As the change in weather marks the beginning of a new season, the first day of December marks the day my mum commences her Christmas baking rituals. With family and friends spread far and wide, she goes into preparation mode to ensure she is ready for when family and friends drop in to visit. Our family Christmas bags are always brimming with home-made goodies, with these Parigini Biscotti (Almond and Cherry Biscuits) and Almond Biscotti sitting as prized packs in the Christmas bags. The first day of December marks the day my mum commences her Christmas baking rituals; our Christmas is never without these Parigini Biscotti (Almond and Cherry Biscuits). Roughly chop the almonds and toast them in a small pan. Combine the eggs, milk and sugar in a bowl and beat until smooth. Melt the butter and pour into the egg mixture, also adding the vanilla essence, almonds and cherries. Blend all the ingredients until well mixed. Add the flour, one cup at a time, blending the flour into the egg mixture to create a firm biscuit dough. You may need to add more flour to ensure the dough is firm. Combine all the ingredients in a bowl to form a sticky but firm biscuit dough. Line two trays with baking paper. Spread the dough mixture across the two trays - you should be able to make four small loaves. Whisk one egg in a small bowl and brush the egg wash over the loaves and sprinkle some sugar over the top of each loaf. Line trays with baking paper and spread the biscuit dough across the trays to form 4 small loaves. Brush the loaves with egg and sprinkle sugar over the top of each loaf. Place into the oven and bake for 15-20 minutes, the loaves will start to turn a light golden colour. Bake the loaves for 15-20 minutes or until the loaves start to turn a light golden colour. Remove from the oven and slice the loaves thinly. Place the biscuits onto the trays and return to the oven to dry out for a couple of minutes. Slice the loaves thinly and place the biscuits back onto the trays and return to the oven to dry out for a couple of minutes. Remove from the oven and cool. Store the biscuits in a sealed tin or container. The biscuits will last for up to a month. As per my Almond Biscotti these will make great little gift bags on their own or you can include in a Food Hamper. 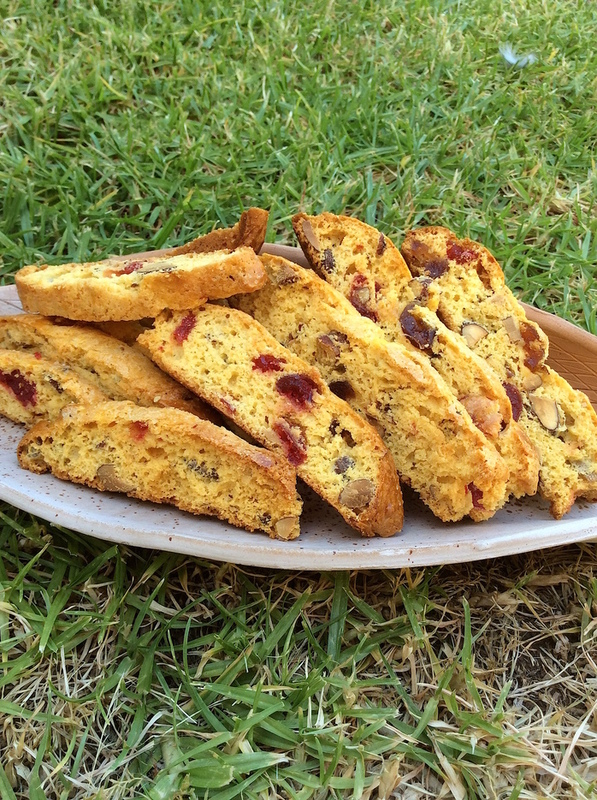 When packaged, these Parigini Biscotti (Almond and Cherry Biscuits) make a great gift to family and friends.